The rooms are often spare. Objects are placed within an arm's length of the bed. There is a hierarchy to this arrangement: Alarm clock, lamp, records or CD's, then books. Other than the occasional poster or picture, personal embellishments are kept to a minimum. The bed is routinely unmade. The sheets (if any) are rumpled in a tangle of musky smell and navy blue. There is sincerity in this restraint. Light is negligible; these are mostly dark places. Windows are undressed, other than blinds. Natural light floods in when it can, and brings with it a cleanliness and clarity that is otherwise neglected. In photographing these spaces I am framing a reality using only natural or incandescent light. The resulting photographic images are sterile and dispassionate. They capture reality, but negate the essence of the interior itself. For this reason, I choose to make paintings of these interiors. The paintings are romantic in their social realism; a celebration of the young single male. 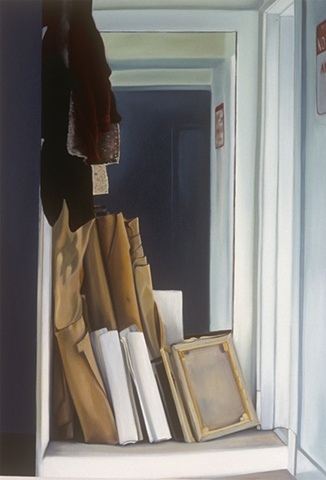 Some paintings are more abstract than others; each is an interpretation of an interior and its absent occupant. They are both document and fantasy.